When I first visit a website, it’s pretty easy to get a sense of whether or not it’s appealing. Are you the same way? On first glance, there are a lot of elements that go into making that first impression. When I stop to truly analyze what those things are, here some pieces that come to mind. Clean homepage. This is your first impression for people coming to your church online. Are you a clean, organized kind of place? Or is everything out of place and cluttered? It’s important to remember that not everything you want to say has to be on the homepage. Organize information into chunks. Keep text to a minimum. Give breathing room and don’t be afraid of white space. Easy to navigate. If your homepage design is clean and well organized, it will be clear where someone should click to find more information. Think of the different people coming to your site and what their needs are while they’re there. How will a visitor know where to click for more information? Will a member know where to click to find upcoming events? Your actual navigation menu can help, too. Make sure those items are limited, easy to understand and well organized. Useful information. 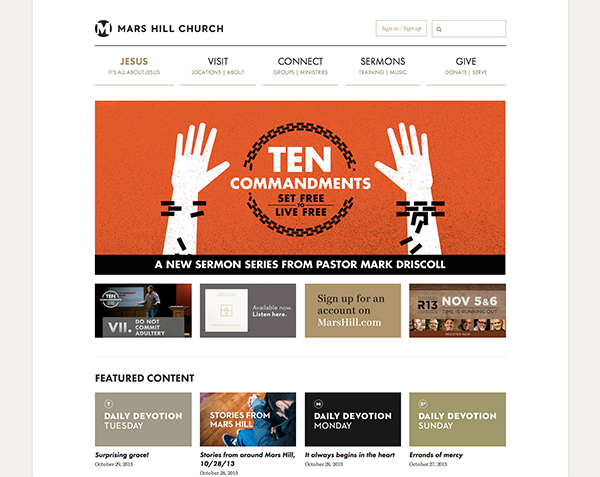 For some churches, the website is the hub where every piece of information goes. That can create a lot of clutter and disorganization. Again, remember your end-user. What information do they need? Also think about your web strategy. What are your goals for sharing information on the website? Like any communications tool, a good website takes strategic thought. Simple information. Another key for making information useful is to make it simple. Just because someone sends you five paragraphs of information doesn’t mean all of it has to go on the website. Part of your job as a communicator is to edit and clarify. How can you make it shorter and simpler so someone actually consumes it? Visually interesting design. I realize defining interesting design is up for interpretation, but I think most web users can tell when a site is graphically up to date. Being up to date means following some trends. 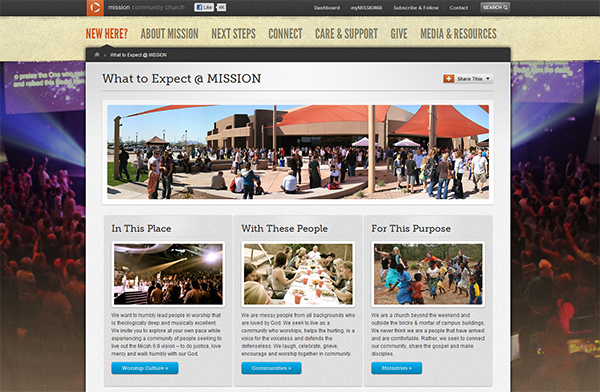 Images play a big role in web design. 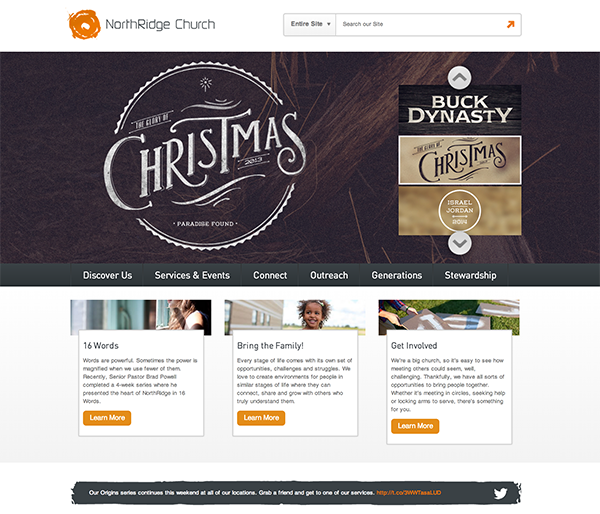 Many churches use pictures that fill the whole width of the screen. 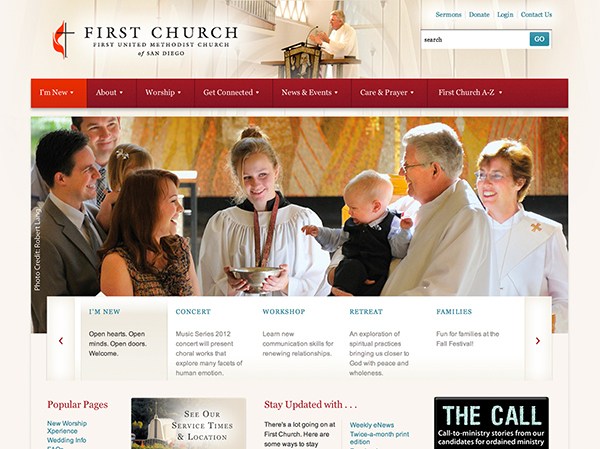 That’s a prime way to say something visually about your church without having to use a single word. And when you do use words, less is more. Small chunks of easily digestible information, supported by a graphic or image, are far more effective then large amounts of text. A true reflection of who you are in person. Part of creating a consistent experience is making sure your website is a good representation of who you are in person. If someone came to your website and then visited you in person, would they feel any sort of disconnect? Be true to who you are. Leverage your strengths. 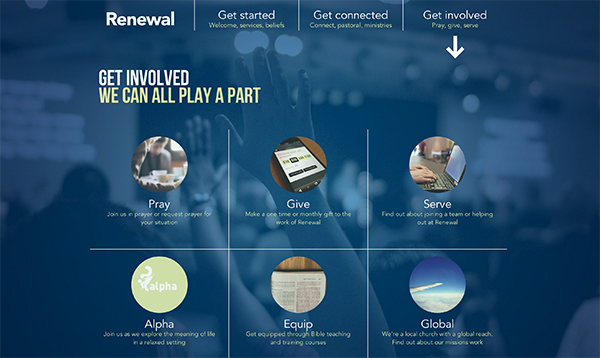 Give people an online glimpse of your church in action. Excellent suggestions and examples. I’ll add a quick note. Visitors are often looking for service times and location. If they can’t find that right away, they might give up. I suggest having this information in a prominent place on the homepage either in its entirety if not too cluttered or in some summary form linking to another page with full details. The user should be able to figure out where this info is within a few seconds. It’s never a bad idea to have a few people test the website before going live. Send them on a info hunt and have them report back on how easy or hard it was for them to find things. Good points. 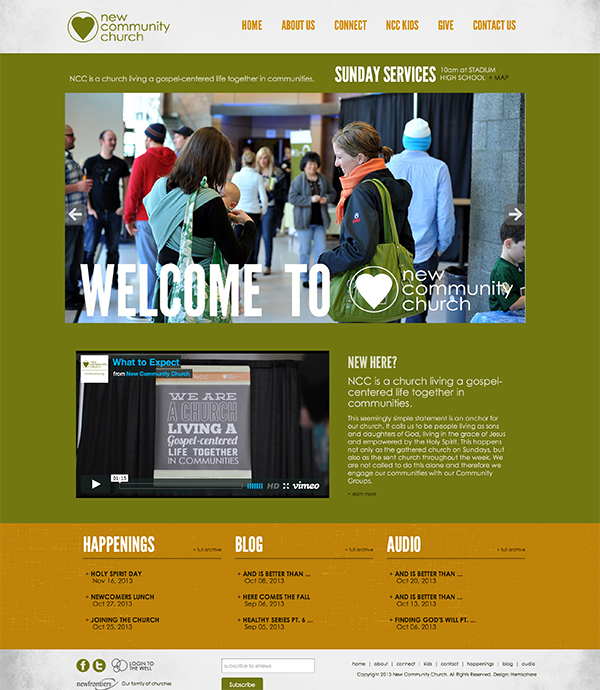 I would add to your list that a good church website should be mobile responsive. Today, that is so important with many people doing searches with their iphones or other smaller devices. 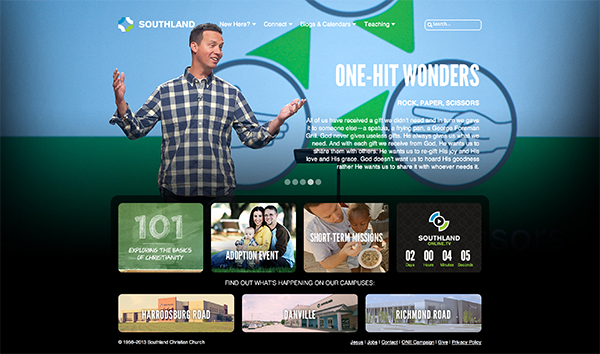 I agree with Steven that the worship time and location needs to be prominent on your home page. I personally like to put a list of upcoming of events in the footer area as well because you never know what my interest someone. 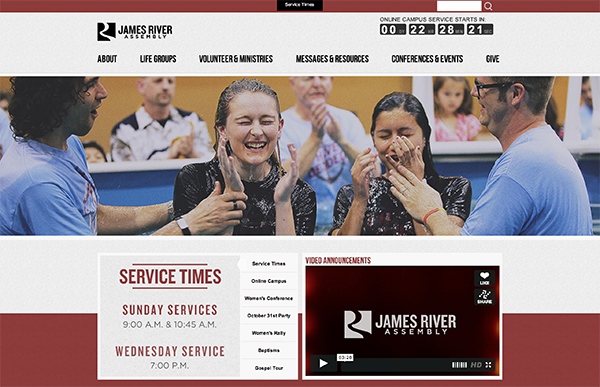 Finally, I think if your church is active on social media, your links to Facebook, Twitter, etc be visible as well. A very good presentation! Thank you. Every church, ministry and non-profit needs to look at their online presence with clear vision, not rose-colored glasses, as they often do. Your tips help guide them to see what they should see. Decluttering every page, not just the home page, is essential. When you land on a page, ask the following questions: Where am I? Why am I here? Where do I go next? While you do address the last 2 questions, you missed the 1st. For some reasons, churches are prone to not tell a viewer where they are - what church? which city? which state? multiple campuses? affiliated with a denomination or non-denomination? The Internet is not small town America, where everyone knows your name and there is no ambiguity. To echo what Steven Gliebe said earlier - people are at your site for a reason: To connect with someone. NAP (name, address, phone number) should be easily found. Visitors or infrequent members are looking for service times. Weddings and funeral guests are looking for specific directions and times. Regular members are looking for meeting times and special event times. Make sure everyone can connect! After location and contact information, upcoming events for both new visitors and long-standing members. If you want people to connect and plug in, tell them who they can connect with, when they can connect and where to connect. Does every page of your website answer those questions?